Why Order Window Screens Online? The real question is “why not order your window screens online?” We order everything else online and will most likely get it within days of your order. Though we still have brick and mortar stores, the need for them is decreasing. The one thing that makes going to a local store more desirable is being able to see what you buy beforehand. However, if you can receive a sample through the mail as well, there is no contest between your local home improvement store and an online retailer. So the next time you need window screens, instead of braving the increasing traffic of your Colorado hometown and going to your local home improvement store, shop for what you need online. You can not only see more options, but you can get all the information that you need. You can also quickly do all the preliminary work before you buy like price comparing and product specifications research. We don’t know about the competition, but when you shop online with Metro Screenworks, you can always assume that you’re getting the advantage of a wide variety of high-quality window screen products at affordable, competitive prices. Metro Screenworks has been in the business of providing high-quality window screen products for over 35 years. Since 1979, we have provided homeowners, building managers, contractors and others high-quality traditional, specialty, and custom window screen options. Located near Denver in Englewood, we are a locally-owned business proud to supply our neighbors with screen products that they can depend on. When you shop at Metro Screenworks, you can expect to get high-quality products and to get window screens that do so much more for you than just keep the bugs out. We offer solar screen, pet screen, retractable screens, air filtration screen, and more! Have questions about any of the products Metro Screenworks offers? Contact us by emailing, calling, or chatting with us. Shop our screen store online today for affordable, high-quality window screens. If you are unfamiliar with speciality and custom screens and what they can do for you, you may be apt to settle for the standard fiberglass or aluminum mesh — which can be just what you need. However, specialty screen can get you so much more for your screens. You can enjoy stronger screens that can withstand the wear and tear of pets, screens that can make your home more energy efficient, and those that you can provide air filtration. Bottomline: Specialty, custom window screens can give you more for your money and provide you more benefits that will save you time and make your life easier. Why Do I Need Window Screens? Window screens are a part of our Colorado homes that are easy to forget about until they are torn or we simply don’t have them. Our screens don’t just keep the bugs and other pests out. Our screens can directly affect our health and well- being. Though there have been versions of screens that have existed throughout history, the screens that we use today come from that which became popular during the Civil War. During that time, a screen like material was used to package cheese. This material was then nailed onto open windows. As the use of screen increased, the spread of certain diseases carried by pests decreased and has become almost completely eradicated. Read more about the History of Screens and learn how something simple has changed our lives. Solar power is becoming more and more popular in Colorado due to our 300 days of sunshine. Also, more people are becoming aware of their energy consumption and the impact that it can have on the environment. Energy-efficient homes are not only saving their owners money, but they are also providing them peace of mind. If you want to take full advantage of available energy, install solar screens! Solar screens block the sun’s heat and UV rays which allows your home to stay cooler and for your AC to run less. Also, because the solar rays aren’t able to penetrate your windows you are also protecting your home’s interior from premature aging. Constant exposure to the sun can cause fading, cracking, and discoloration. Solar screen can protect your home from pests and the sun and premature deterioration. Thankfully in Colorado, we don’t have to worry about as much pollution as other parts of the country, but we still have allergy season to contend with. Nothing is worse than wanting to open the windows of your home and have to contemplate hours, if not days of personal discomfort and misery. Our air filtration screens can allow you to open your windows, enjoy the fresh air without letting smog, pollution, and allergens into your home. We love our fur babies, but it’s easy to get frustrated with them and to be thankful that they are cute, when we see the destruction that they wreak on our window screens. Whether it’s your cat climbing your window screen or your dog pawing at the door, it’s easy for standard screening mesh to get ripped to shreds. Pet screen is vinyl-coated screen that is seven times stronger than traditional fiberglass mesh. We also offer a pet screen door, as well as colored pet screen for craft and home improvement projects. Install pet screen and experience the difference. Colorado is a beautiful place full of scenic views that should be enjoyed unimpeded by a screen. Instead of thinking about going screenless, install invisible screens! Our invisible screens by BetterVue and SeeVue, are nearly undetectable and can be used in window screens and screened-in porch panels. Also, just because invisible screen is nearly undetectable, doesn’t mean it can’t withstand normal use. 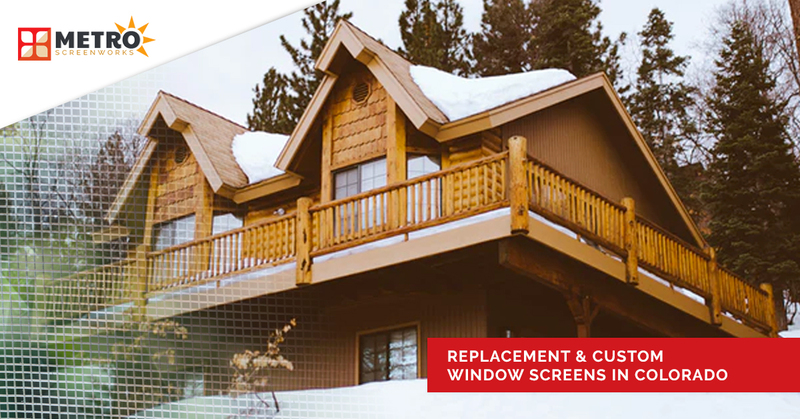 Invest in replacement window screens for your Colorado home through buying our complete window screens with invisible screen or our invisible screen rolls. Are there areas of your home where you need screens sometimes, but not all the time? Genius retractable screens give you options. Do you wish to screen in your porch to allow you to enjoy warm summer nights without mosquitos? Install retractable screens! Pull them down when you want to use your porch and roll up out of the way when you’re done. Learn more about how retractable screens can fit your lifestyle and shop the options that we provide online. After reading about all the options that our custom window screens provide, we are sure that you are ready to get started replacing your old screens. Once you’ve decided what kind of replacement window screens you want, it’s time to measure your old screens and make sure you order a window screen that will fit your window. How do I measure window screens? The best way to order a replacement window screen is to measure your old screen. All you need is a pen and paper, and a tape measure. Step 1: Measure the Shortest Side Measure the shortest side of your screen first. You will want to measure to the closest 1/16 of an inch. Step 2: Measure the Longest Side Next, measure the longest side. Again, you will want to measure it to the closest 1/16 of an inch. Have questions about how to measure for new screens? Contact, email, call, or chat the window screens at Metro Screenworks! We would love to help you. How do you measure a window? If you don’t have the original screen for your window, the measuring process is a little more complicated. However, once you know how to do it, it’s easy. First, if you don’t have a screen for one window, check the screens of the rest of your house and see if any of them are the same size. Secondly, if you live in apartments or tract housing in your Colorado town, you can borrow your neighbor's screen and measure it as well. If these options aren’t available or you want to make sure that you are getting the right size replacement window screen, follow the steps below. First, you need to find the lip of the screen channel at the bottom of your window frame. Once you’ve found the lip, measure up to the screen channel above. Subtract ⅛ of an inch from the measurement and record the measurement. Next, measure the bottom screen horizontally. Subtract an ⅛ of an inch from the measurement and record it. Step 2: This is the lip. Measure as you would traditional windows.Step 3: Subtract an 1/8 of an inch from width and height. Step 3: Subtract ⅛ inch. Once you’ve measured your window it’s time to look at the hardware that you need to install your screen. If you get the right measurements, but fail to order the right hardware you are still going to have a hard time getting your screen to fit in your window screen. Check out the graphic below and if you have any questions, contact Metro Screenworks! We know everything about screens and can help you get all the right information so you can order the screens you need. 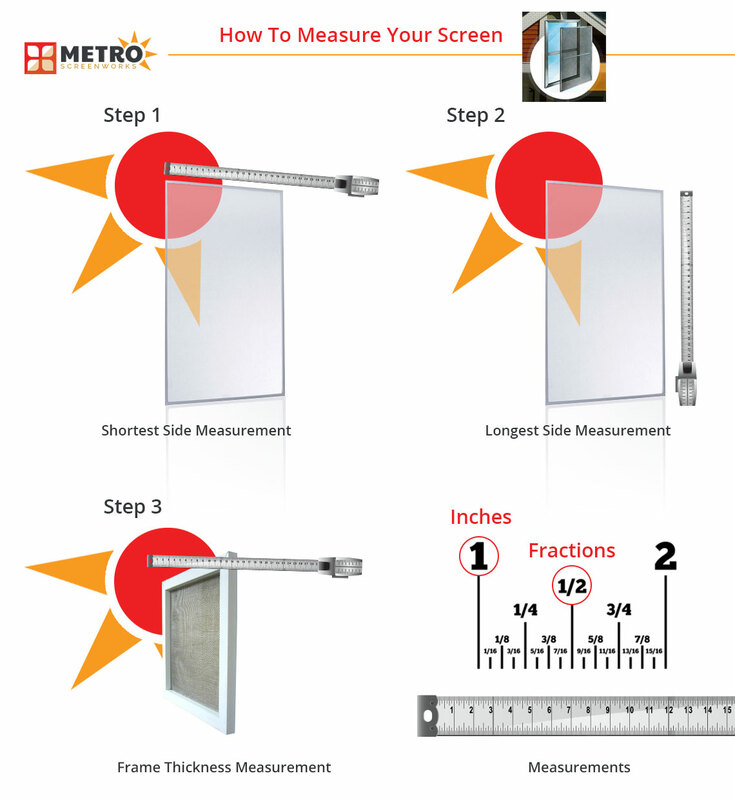 Have Questions About Measuring for Replacement Window Screens? As we’ve mentioned several times above, the screen experts at Metro Screenworks want to help you as you order for your new window screens. 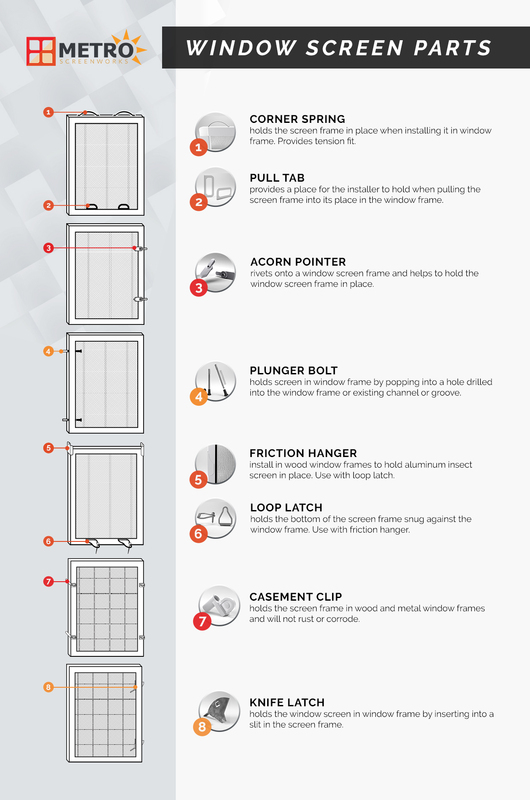 We understand that if you aren’t familiar with window screens that it can seem a little complicated. However, you’ve got us on your side! Want to learn more about home improvement, interesting history, and other information related to window screens? Read our blog! We post regularly to help you get the most out of your screens and to provide other helpful information. Read recent posts below or check out our archive!